The town of Possagno is located 50 kilometres north-west of Venice. It is most famous as the birthplace of the sculptor Antonio Canova. Possagno is not reachable by train, but there are busses from Bassano del Grappa and Castelfranco Veneto. 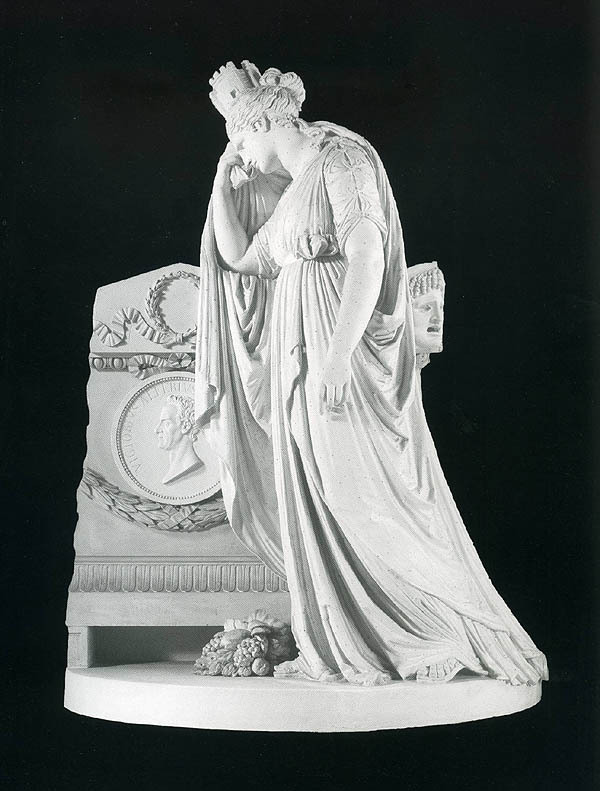 1 Elena Bassi, Antonio Canova a Possagno: Catalogo delle Opere, Guida alla Visita della Gipsoteca, Case e Tempio (Treviso: Edizioni Canova, 1972), 100. The model measures 69 cm X 58 cm X 10.5 cm. 2 Bassi, 102. The model measures 60 cm high X 165 cm wide. 3 Bassi, 102. Both models measure 215 cm high X 115 cm wide. 4 Bassi, 65-66. The stele measures 367 cm high X 210 cm wide. The small model of Italia measures 69 cm X 35 cm X 28 cm. The model of the final monument measures 310 cm X 240 cm X 95 cm. The second figure of Italia measures 109 cm X 97 cm X 77 cm. Image 1 (Gesso model of the Monument to Count Vittorio Alfieri): Aldo Scibona, Canova, La Mano di Dio: Biografia (Villorba: Edizioni Treviso, 2008), 262. This page is maintained by Noel S. McFerran (noel.mcferran@rogers.com) and was last updated March 29, 2012. © Noel S. McFerran 2010-2012.